We ended up having leftovers a couple of times last week (almost unheard of in this house), so I didn't make everything on my menus. I love it when that happens! Because of that, I have some duplicates. The breakfasts look large with whole grains and smoothies or a protein, but I am using smaller servings. I am trying to get a nice variety of nutrients in first thing every day. Ideas are appreciated! I'm going to try a large brunch and see if I can get away with two meals, as I do a lot of cooking & baking for the week on Saturdays. My menu plan calendar is available here if you are interested in seeing it. I keep that current each day when meals change (as they often do). It also includes daily cooking notes. I have it set up to send me an agenda via e-mail every day, which is very helpful. 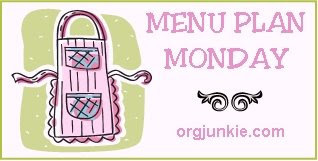 For more menu plans, go to orgjunkie.com.